Climate change in the Arctic and Boreal region is unfolding faster than anywhere else on Earth, resulting in reduced Arctic sea ice, thawing of permafrost soils, decomposition of long- frozen organic matter, widespread changes to lakes, rivers, coastlines, and alterations of ecosystem structure and function. NASA's Terrestrial Ecology Program is conducting a major field campaign, the Arctic-Boreal Vulnerability Experiment (ABoVE), in Alaska and western Canada, for 8 to 10 years, starting in 2015. ABoVE seeks a better understanding of the vulnerability and resilience of ecosystems and society to this changing environment. 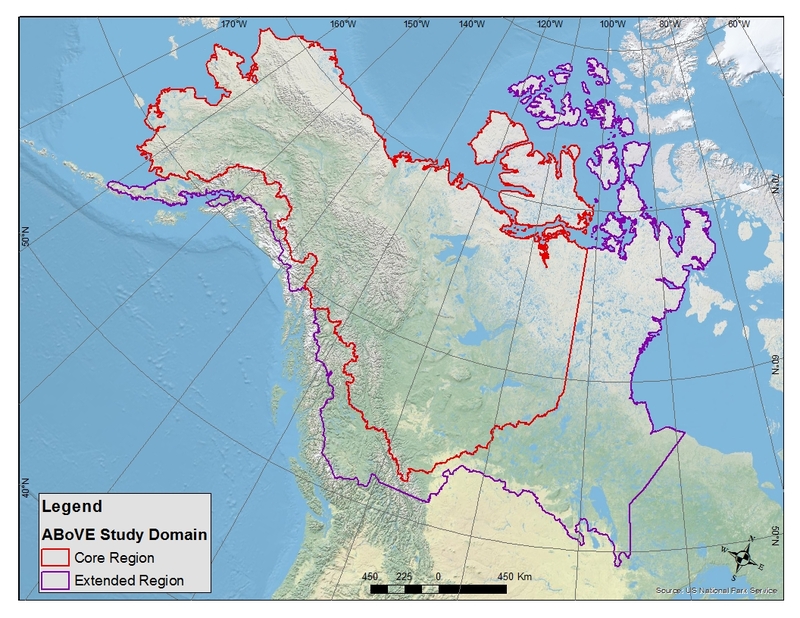 The Arctic-Boreal Vulnerability Experiment (ABoVE) is a NASA Terrestrial Ecology Program field campaign that will be conducted in Alaska and Western Canada (see Study Domain). ABoVE is a large-scale study of environmental change and its implications for social-ecological systems. ABoVE’s science objectives are broadly focused on (1) gaining a better understanding of the vulnerability and resilience of Arctic and boreal ecosystems to environmental change in western North America, and (2) providing the scientific basis for informed decision-making to guide societal responses at local to international levels. Research for ABoVE will link field-based, process-level studies with geospatial data products derived from airborne and satellite sensors, providing a foundation for improving the analysis, and modeling capabilities needed to understand and predict ecosystem responses and societal implications. The planning for ABoVE started in 2009 with a scoping study. Throughout 2013, the science definition team wrote a concise experiment plan that was completed 2014. The first ABoVE call for proposals appeared in ROSES 2014 (see Timeline). Why do we need to study the Arctic and Boreal Region? Climate change in the Arctic and Boreal Region (ABR) is unfolding faster than anywhere else on Earth, resulting in reduced volume and area of sea ice in the Arctic Ocean during summer, warming and thawing of permafrost, increases in the frequency and severity of climate-driven disturbances, and widespread changes to surface water extent, soil moisture, and vegetation structure and function. Environmental and climate change in the ABR is increasingly affecting society both locally and globally. Changes to forests from insects and fires, erosion of Arctic coastlines, and altered wildlife habitats that support subsistence opportunities may affect residents of the ABR both positively and negatively. The ABR also contains a globally significant amount of carbon in both the soils and vegetation, and it is unknown how much of this sequestered carbon will be released to the atmosphere as permafrost thaws and forests burn, potentially further accelerating global climate change. Research addressing the ABoVE research objectives benefits from the unique capabilities provided by remote sensing data. Data products from new and existing satellite and airborne remote sensing systems allow for the study of seasonal and inter-annual variability over large geographic regions. At landscape to regional scales, these data products will be critical to the spatial and temporal scaling of observations made from field studies. Conversely, field observations play a vital role in the refinement and validation of remotely sensed data products. 1. [Ecosystem Services] How are environmental changes affecting critical ecosystem services - natural and cultural resources, human health, infrastructure, and climate regulation - and how are human societies responding? 2. [Disturbance Regimes] What processes are contributing to changes in disturbance regimes and what are the impacts of these changes? 3. [Permafrost] What processes are controlling changes in the distribution and properties of permafrost and what are the impacts of these changes? 4. [Hydrologic System]What are the causes and consequences of changes in the hydrologic system, specifically the amount, temporal distribution, and discharge of surface and subsurface water? 5. [Flora and Fauna] How are flora and fauna responding to changes in biotic and abiotic conditions, and what are the impacts on ecosystem structure and function? 6. [Carbon Pools] How are the magnitudes, fates, and landatmosphere exchanges of carbon pools responding to environmental change, and what are the biogeochemical mechanisms driving these changes? 1. [Permafrost Vulnerability Resilience] Determine how interactions among vegetation, soil characteristics, hydrology, and disturbances influence surface energy exchange and mediate permafrost vulnerability and resilience to climate change. 2. [Microbes, Plants, Animal Interactions] Determine how and where interactions among microbes, plants, and animals exert control over ecosystem responses to climate change and disturbances. 3. [Vegetation, hydrology, disturbance interactions] Understand how vegetation attributes and hydrologic conditions interact, and respond and feedback to disturbance. 4. [Snow Impacts] Quantify how changes in the spatial and temporal distribution of snow impacts ecosystem structure and function. 5. [Vegetation Greening and Browning] Determine the causes of greening and browning trends and their impacts on ecosystem form and function. 6. [Controls on Carbon Biogeochemistry] Elucidate how climate change and disturbances interact with above- and belowground communities and processes to alter carbon biogeochemistry, including release to surface waters and the atmosphere. 7. [Changes to Fish and Wildlife Habitat]Determine how the spatial and temporal dynamics in both faunal abundance and characteristics of fish and wildlife habitat co-vary across gradients of climate and disturbance. 1. [Transportation & Infrastructure] Assess how future climate warming is likely to affect infrastructure and transportation networks. 2. [Human Health] Determine how changes to disturbance regimes, flora and fauna, permafrost conditions, and/or hydrology influence human health outcomes in the ABR. 3. [Subsistence] Evaluate how changes to ecosystems will influence subsistence opportunities. 4. [Land Management]Analyze how changes to natural and cultural resources will impact local communities as well as influence land management policies and practices. 5. [Climate Regulation] Determine the sources of variations in climate feedbacks from Arctic and boreal ecosystems and assess the potential for future changes to climate regulating services at regional to global scales. 6. [Ecosystem Services Interactions] Determine the degree to which changing environment and altered human activities result in synergistic or antagonistic changes in ecosystem services. Research and analysis activities for ABoVE will be carried out in study sites located across western Canada and Alaska. Studies will be carried out over a range of spatial scales, including within different terrestrial ecoregions, within primary and secondary research areas, within discrete landscape units (such as a watershed ordisturbance event), and within plots (at a scale of 10 m to 1 km). The exact geographic boundaries and location of study sites will be determined in the more detailed planning activities to follow, and will be influenced by collaborating programs and projects. Download the ESRI Shapefile, KMZ, TIFF or access on the web of the ABoVE Study Domain as an item in ArcGIS Online where it can be viewed, downloaded locally, or added to a map as a web feature service. The conceptual timeline for ABoVE Research Activities presented in the ABoVE Concise Experiment Plan (ACEP Table 4.1 below) generally follows three objective-driven phases over the 9 to 10 year period of the Field Campaign. The research focus will evolve across each phase as guided by the Vulnerability/Resilience Framework, where studies of ecosystem dynamics provide the foundation for further research on the consequences to and responses of society to changes in ecosystem services. The first two phases will predominately focus on the Ecosystem Dynamics Objectives and the Ecosystem Services Objectives, respectively, and will include the bulk of the Intensive Study Period. While each phase has a focus area of research, this should not preclude studies designed to address the other questions and objectives as warranted. A final phase focused on the analysis and synthesis of ABoVE research is needed following the completion of the main portion of field and airborne data collection activities. Project Teams will collect data for Phases I and II over a 5 to 7 year Intensive Study Period. The major portion of the field-based studies and airborne remote sensing campaigns will occur during this time. 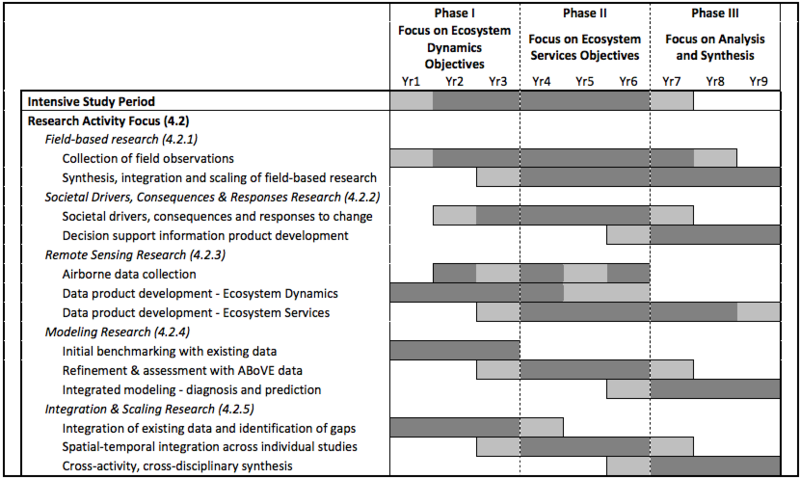 Research contributing to the Ecosystem Dynamics Objectives is emphasized during Phase I. These investigations focus on the major ecosystem responses to changes in drivers, along with the complex interactions among the drivers and the responses. To establish a basis for research on the Ecosystem Services Objectives that will be the focus of Phase II, some studies on the societal drivers and responses to change will need to begin during Phase I. Phase I research will make significant contributions to the observational data collections, model refinements and geospatial synthesis products that will provide the foundation for the Phase II and III research activities addressing the interdisciplinary research objectives. Following the completion of the Intensive Study Period, studies conducted during Phase III will focus on cross-activity, cross-disciplinary research involving the Analysis and Synthesis of data and findings from the first two phases. This phase includes the synthesis, integration and scaling of basic social and ecological research, the employment of integrated modeling frameworks for diagnosis and prediction, and the development of decision support information products. AGU has established a set of guidelines for scientific integrity and professional ethics for the actions of the members and the governance of the union in its internal activities; in its public persona; and most importantly, in the research and peer review processes of its scientific publications, its communications and outreach, and its scientific meetings. Since its inception the Arctic Council has recognized the central role of the Indigenous peoples of the Arctic in all aspects of the Arctic Council mandate and has formally endorsed the importance of including the Indigenous residents of the Arctic in its deliberations. Guiding Principle #1: Recognize the value of Traditional Knowledge (TK) as a systematic way of thinking which will enhance and illuminate our understanding of the Arctic environment and promote a more complete knowledge base. 2011 Summary of Community-Submitted Comments on ABoVE Final Report available here. Comment period closed August 5. 2009 Two scoping studies were selected. ABoVE (Arctic-Boreal Vulnerability Experiment formerly known as VuRSAL (Vulnerability and Resiliency of Arctic and Sub-Arctic Landscapes) (abstract) and Tree-Grass Study (abstract) selected for 1 year. 2008 NASA TE NRA — NASA’s Terrestrial Ecology Program solicited proposals in ROSES 2008 for scoping studies to identify the scientific questions and develop the initial study design and implementation concept for possible future NASA field campaigns.